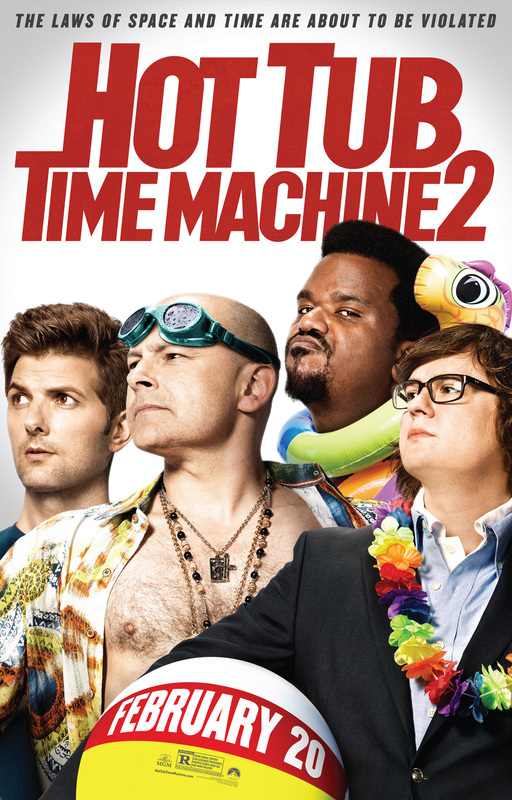 Hot Tub Time Machine was the sleeper hit of 2010, armed with enough jokes and heart to charm audiences, and fill the Back to the Future/Hangover cross-over niche that nobody even knew existed. The sequel, Hot Tub Time Machine 2, has the jokes but is sadly lacking the heart. The movie kicks off in the alternate reality created by the events of the last movie. Lou, played by a strangely unlikeable Rob Corddry, is now the “father of the internet.” Nick (Craig Robinson) is a famous musician ripping off tunes from the future, and Jacob (Clark Duke) is still a nerd. Adam (John Cusack) from the first movie is not in evidence and is sorely missed. Things kick off with a visit by an assassin from the future; the troubled trio must go back to the future to prevent the crime. Future shenanigans ensue. Hot Tub Time Machine 2 has its moments. There are enough jokes, barely, to sustain the premise; the problem is that these scenes are largely unconnected and one-note. The interactions between the three characters still manage to bring in some laughs, but there is something amiss: John Cusack. Without Cusack’s everyman to balance out the crazy and serve as a kind of audience surrogate, there is simply nobody that the audience can root for—all the other characters are just too weird! Cusack’s Adam and his emotional journey was the heart of the first movie, Hot Tub Time Machine 2 is strangely charmless without him. So yes, Nick Robinson singing in a shot-for-shot accurate remake of Lisa Loeb’s Stay will certainly make the audience chortle, and the same goes for a dozen other gags and quotes. However, without somebody to care about, Hot Tub Time Machine 2 falls short.